Heard the one about the online seller who was laughing all the way to the bank? Follow these tips and watch the good reviews roll in. They say time is money, but in the world of online selling, it’s also the key to customer satisfaction. According to Business Insider, 53% of customers who choose bricks-and-mortar over online shopping do so because they can get their purchase immediately. Getting items shipped out in good time is essential, as is setting expectations about what will happen and when. Make sure your customer gets prompt answers to their questions and timely updates on when their items have been prepared and sent. When planning your product launches and marketing, take your cues from the world around you. Red letter days like Christmas, Father’s Day and Easter are sure-fire winners, and you can steer customers towards appropriate gifts for these events with a well-timed email or a promotional message on your website. Then there are quirkier dates, like International Jazz Day (April 30th). If the strategy suits you, go one step further – linking your products with positive news events, trends, popular culture and just about anything that taps into the zeitgeist can help boost your sales. Just don’t go too esoteric – a themed collection of Game of Thrones tea-cosies may not reach a wide enough audience to justify the cost of production. A successful stand-up needs to be able to get on stage, take the mic and get their voice heard. An attention-grabbing opener is great for getting the crowd’s attention. In the world of online selling, you can follow their example with strong marketing that creates a memorable first impression and a proactive approach to promoting your work. That might mean creating a new physical presence with a craft fair stand, taking part in a networking event, or reaching out to potential stockists and customers with a postcard mailout. Live stand-up comedy is famous for its performer-audience interaction. Fortunately, you don’t need to worry about hecklers or make jokes about the guy taking a phone call in the front row. You can use your business model to make personal connections with your audience in a positive way. There are so many ways to do this, from adding personal thank-you notes that create an awesome unboxing experience to featuring customer’s photos and messages in your online shop. Whatever your strategy to make your business stand out in the crowd, there’s one important goal – to sell your products. 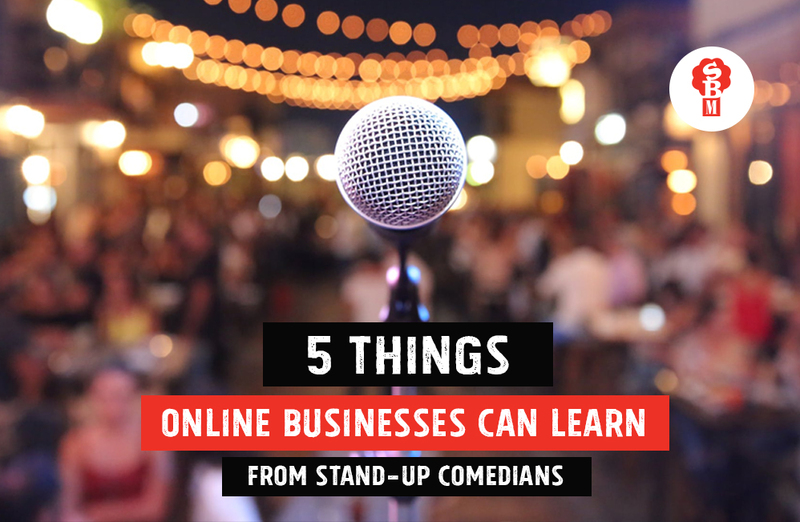 Like a stand-up performer, you’ll need to keep track of all kinds of factors like how the audience is reacting, when to deliver your next line (or your next package), and how to keep up momentum when things are going well. But above all, you need to keep customers engaging with you and making purchases. If that’s happening, you’re doing it right, whether or not you’re following other people’s advice, so don’t be afraid to do things your own way and break the rules – a bit like with stand-up comedy, in fact. Want to chat about the potential of your online business?